Fri., Sept. 29, 2017, 10:44 a.m.
Thousands of cargo containers bearing millions of emergency meals and other relief supplies have been piling up on San Juan’s docks since Saturday – and may not reach storm survivors for days. Distributors for big-box companies and smaller retailers are unloading 4,000 20-foot containers full of necessities like food, water and soap this week at a dock in Puerto Rico’s capital operated by Crowley Maritime. In the past few days, Tote Maritime’s terminal has taken the equivalent of almost 3,000. Even with moves to ease shipping to the island, like the Trump administration’s waiver of the Jones Act on Thursday, the facilities have become choke points in the effort to aid survivors of Hurricane Maria. About 30 minutes before Wednesday’s 7 p.m. curfew, there were few signs of life at the Crowley port besides circling bats. The ground was muddy and the chain-link fence protecting the containers listed to the side. Without street or traffic lights, the area was dark, except for one illuminated crane holding a yellow container waiting to be set down in a row of its blue and red fellows. The race to move the boxes could mean life or death. The island of 3.4 million is in the throes of a burgeoning humanitarian crisis, without electricity, mobile-phone service or clean water. Puerto Rico’s power grid went dark during the hottest season of year and may stay down for weeks or months. Of the commonwealth’s 69 hospitals, only 11 have power and fuel. Officials and residents warn of disease without access to clean water. The devastation is the result of the third deadly hurricane within the past month to confront the Federal Emergency Management Agency and Defense Department. 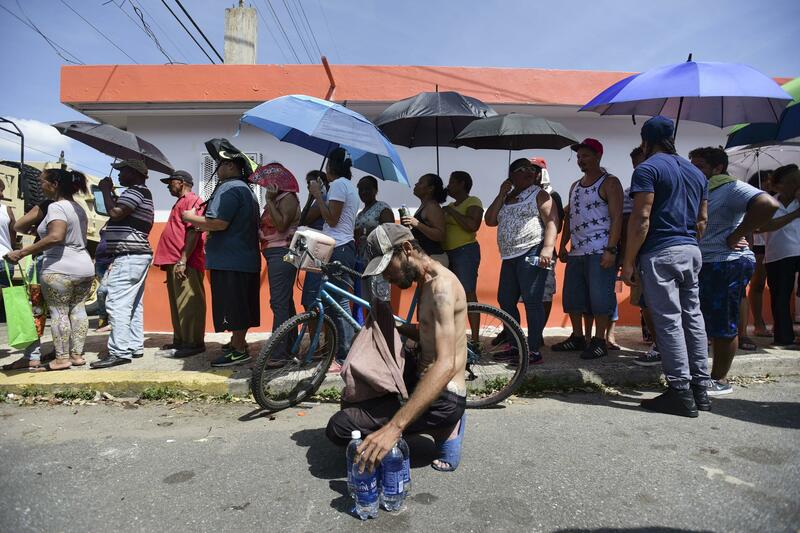 The recovery has lagged due to what Governor Ricardo Rossello on Thursday called the “total collapse” of power infrastructure. Maria was the “worst natural catastrophe” to occur on the island, affecting the entirety of the territory, he said. The U.S. government has now shipped 4 million meals and 1.59 million gallons of water. Rosello said 2 million more gallons are expected to come in days. Domestic firms have moved 9,500 containers to Puerto Rico, according to the American Maritime Partnership. Early Thursday, six tankers holding almost 76,000 gallons of fuels like gasoline and diesel were anchored in the waters outside the island, Bloomberg vessel-tracking data show. Trucks are ready to be loaded with the goods and precious diesel for backup generators, but workers aren’t around to drive. Instead, they’re caring for families and cleaning up flood damage — and contending with the curfew. The buildings that would receive supplies are destroyed and without electricity, Miller said. The transport companies that have staff available and diesel on hand encounter downed poles and power lines while navigating 80,000-pound tractor-trailers on delicate washed-out roads. Russel Honore, a retired Army lieutenant general who took over the federal response to Hurricane Katrina in 2005, said the efforts in Puerto Rico require what he called “expeditionary logistics” — ships, aircraft and trucks that can move goods onto and around the island. Brig. Gen. Rich Kim, the U.S. Army North deputy commanding general, will establish a headquarters to help manage the response, the Defense Department said in a news release. In Washington, debate swirled this week around the 1920 Jones Act, which requires shipments of goods between two U.S. ports to be made with American-flagged vessels, limiting the amount of shipping and driving up its cost. Early Thursday, President Donald Trump authorized a waiver of the rule to ease the emergency response. Critics of the rule said suspending it — or ending it — is key to helping the stricken island throughout the week. The administration temporarily lifted the rule earlier this month to ensure gasoline-starved Florida received supplies after Hurricane Harvey. And foreign ships that took on gasoline or diesel before 11:59 p.m. Sept. 22 under that waiver are still allowed to unload on U.S. soil, Customs and Border Protection spokesman Gregory Moore said last week. At least one foreign tanker that left Louisiana last week took advantage of the existing waiver to help Maria victims in Puerto Rico, according to shipping and chartering data compiled by Bloomberg. Meanwhile, Crowley’s storage space in San Juan is clogged by containers full of goods that normally would go on the shelves of stores like Wal-Mart. Miller said those boxes must move so the company can get even more emergency supplies on the ground. Published: Sept. 29, 2017, 10:44 a.m.